Digest Can You Handle A Meat-Free Future? Can You Handle A Meat-Free Future? People of Yunnan Restaurant is a small eatery on a quiet side street in Hong Kong’s San Po Kong district, and may seem an unlikely place to taste the future of food. But this casual dining spot, specialising in traditional cuisine from the south-western Chinese province of its name, serves what many are hailing as a solution to world hunger and the harmful effects of livestock farming: edible insects. Li might be on to something: a typical mealworm provides the same protein, vitamins and minerals as fish and meat, and more unsaturated omega-3 and fatty acids than cattle and pigs. What’s more, thanks to a growing body of research into food security and the environmental impact of the livestock and fisheries industries, insects are emerging as a potential alternative to conventional animal protein. The Food and Agriculture Organization of the United Nations (FAO) has stated that current food production will almost need to double to accommodate the nine billion people projected to be on the planet by 2050. According to a report published by the FAO in 2013, “Land is scarce and expanding the area devoted to farming is rarely a viable or sustainable option. Oceans are over-fished and climate change and related water shortages could have profound implications for food production. For some, including Ethan Brown, CEO of Beyond Meat, a Los Angeles-based producer of meat-like but plant-based food products, that means completely replacing animal protein with plant protein. The company’s Beyond Burger uses peas for protein, beets for colour, and coconut oil and potato starch for juiciness and chew, resulting in a burger so meat-like that it’s sold alongside the real thing at retailers. Plant-based foods maker Hampton Creek Foods, based in San Francisco, has a Just line of mayonnaise, dressings and cookie dough concocted entirely from plant-derived ingredients. Also in San Francisco, cellular agriculture company Perfect Day Foods makes milk without the help of cows (using yeast and fermentation). In Germany, food technologists at the Fraunhofer Institute for Process Engineering and Packaging have extracted protein from sweet blue lupine seeds to make a milk-tasting ice cream. The answer, claims Valeti (alongside a growing body of scientists, entrepreneurs and high-profile investors), is “clean meat”, or meat engineered directly from animal cells, thereby doing away with the need to feed, breed or slaughter animals. 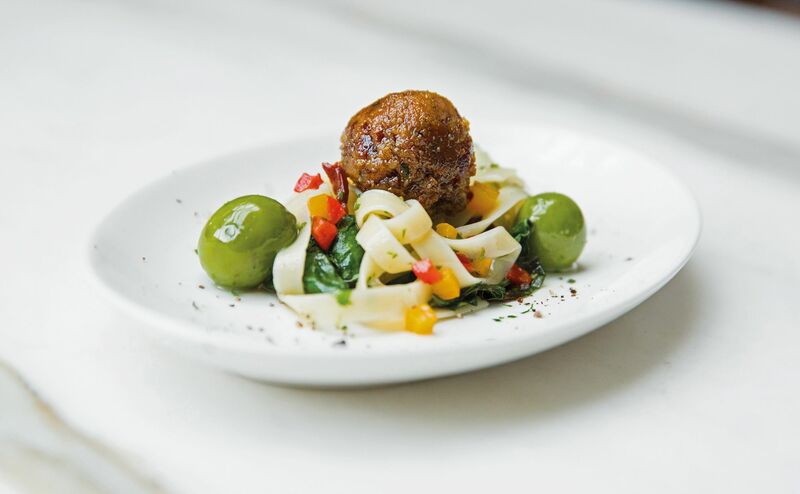 Memphis Meats made the world’s first clean meatball in 2016, and first clean poultry in 2017, joining others such as Dutch company Mosa Meat, which unveiled the first lab-grown burger in 2013, and Finless Foods, also headquartered in San Francisco, which is developing seafood products using similar cellular technologies. Most experts agree, however, that it will be at least five years before clean meat is available. In the meantime, food researchers and pioneering chefs are looking to the estimated 1,900 species of insects that are already being eaten by two billion people worldwide. These “stupendously efficient meat machines”, as described by entrepreneur and edible-insects expert Harman Singh Johar, require significantly less space, water and feed than cattle. They can also be found in a wide variety of habitats, are capable of being processed into granular or paste forms, and may pose less risk of transferring disease than mammals and birds. “A lot of ingredients these days have additives, but not insects because they are just caught and frozen,” explains chef Li of People of Yunnan Restaurant in Hong Kong, who sources his insects from Yunnan. “They are also very clean because what they eat – plants, bamboo, corn – is very clean.” Li uses traditional methods when preparing bugs, such as deep-frying grasshoppers to make their hard shells easier to consume, and lightly frying creamy bamboo worms before mixing them into an omelette. “The biggest discovery in our research is that insects represent such a large diversity, and that such a vast range of cultures have insects deeply embedded in their food habits,” says Michael Bom Frøst, director of the non-profit Nordic Food Lab in Copenhagen, and co-author of the book On Eating Insects: Essays, Stories and Recipes, released in May 2017. Olvera says that in Mexico, insects are most commonly used in salsas, tacos or mixed with salt to accompany mescal and other drinks. He is one of several chefs there who are elevating bugs from street-stall fare to sophisticated fine dining, and his flair for distilling “the taste of terroir” can be experienced in his dish of baby corn with chicatana ant mayonnaise, inspired by a favourite rainy afternoon snack, and a seasonal dish of escamole (queen-ant eggs, dubbed “Mexican caviar”) sautéed with onion, garlic and chilli, and served with roasted leek and a bone-marrow confit.